Beware Preacher! of ever using a quotation from Jesus to illustrate a matter within the pastoral trade. 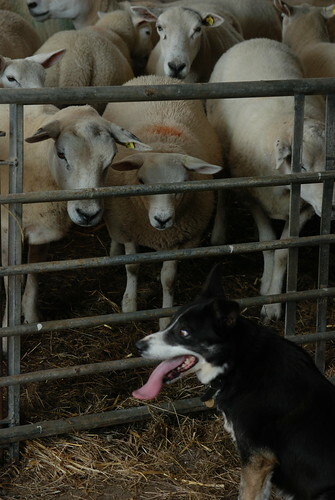 We are not shepherds, but sheep dogs at best. But it is nice to know that the shepherd, despite St. John’s penchant for idealizing the Lord and his work, actually lost some sheep. Let it be a praise to the Lord that the grace made known to us in Jesus Christ was extended to these lost sheep anyhow, lest anyone, or anydog, return them to the fold. It seems doubly cruel that this kind of reflection comes at Charge Conference time. Though largely a matter of denominational maintenance, I usually get a certain melancholy during this time of year. The reflection on the past year necessitated by this practice is less humbling in the classical sense and more humiliating in the common sense. Nothing like looking in the rear-view mirror and seeing a steaming pile of iniquity with your name on it. Let this be our background image for today. It is against this backdrop that a brief conversation arose regarding one who had left the church. Both the inquiry and the following discussion were innocent and nothing that was said was disrespectful or untrue. It was accurately stated that the person left the church because worship was not inspiring. As the only worship planner in the room, I felt the spotlight as people bumbled to make deflecting remarks before talking around the matter and returning to the agenda. I think most persons were aware that there were other factors in this departure, but the reason stated was right. All jobs come with failure. When I was loading trucks for UPS, I frequently overlooked next-day-airs that wound up costing the company money. But losing a parishioner fails God; fails the church that, at 40 members, can’t afford losing any; fails the rest of the parishioners who are left wondering if they too should seek greener pastures. One of the difficulties is that the departure took place over a year ago, and yet the loss is still felt on at least a portion of the congregation. And I am still responsible for it. All day, I have replayed the 15 second exchange from last night. I have about 2-3 things I wish I had said. I wish I had explained all of the conversations between my and that parishioner, not just the ones they know about. But I guess confidentiality sometimes means taking the blame. I wish I had explained just how tiring it is to preach and lead worship. I forget who, but someone described preaching as peeling away one’s skin…one is just so raw and susceptible to criticism afterwards. I wish I had explained that bringing energy to worship is a communal responsibility. Yes, the pastor has to be prepared and hopeful, but parishioners unprepared to worship is its own problem. I wish I had explained that one must wisely choose how to use one’s energy, and that some efforts are so fruitless that it is wasteful of human energy (such as trying to win that person back). Though I wonder if I should have made better effort to reclaim that person (ala the Good Shepherd). I wish I had explained that I am human and mistake-prone. Most, if not all, in the room last night understand that . I wish I had explained that when faced with a seemingly incurable situation, it is wise to ‘let go and let God’; to humbly submit the matter to God, confessing that I am powerless to remedy it. This is pretty much what I did. I wish I had explained that there are other churches and that the fact that the one who left has found another church is good news, though maybe still painful to us. Instead, I just maintained my silence until the matter had passed. Of course, it has yet to pass from me. Just as I was ready to hit the Publish button, I scanned through and saw this post by William Willimon. In it he briefly reflects on the possibilities of the presence of conflict in the congregation. This doesn’t change my responsibility for losing a parishioner. But it does allow me to claim that not all is lost. That is good.